Winter in California means rain, and a lot of it! The past week or so, we’ve had quite a bit of that wet stuff and I definitely was not prepared for it! I think any other Californian will back me up when the weatherman says it’s going to rain, it usually doesn’t, or it’s just enough to make your car dewy in the morning but that’s it. My under confidence in the forecast led to a nasty looking stall and horse this weekend and I spent some time paying the price. In this blog I’m going to give a couple tips on how to prepare for the wet season. First and foremost, if your horse is in an outdoor stall like mine, get the wood pellets! They save so much time if you put them in the stall before the rain happens. But they are very useful if you forget and must use them in aftermath as well (like me). There are several different brands and I’m sure depending on where you’re located the bag size will differ, but they are hard wood pellets specifically designed for animals (non-toxic, no chemicals, etc). When you put them on the ground and it rains, or if the ground is already wet they absorb the moisture and turn into shavings as they break down. 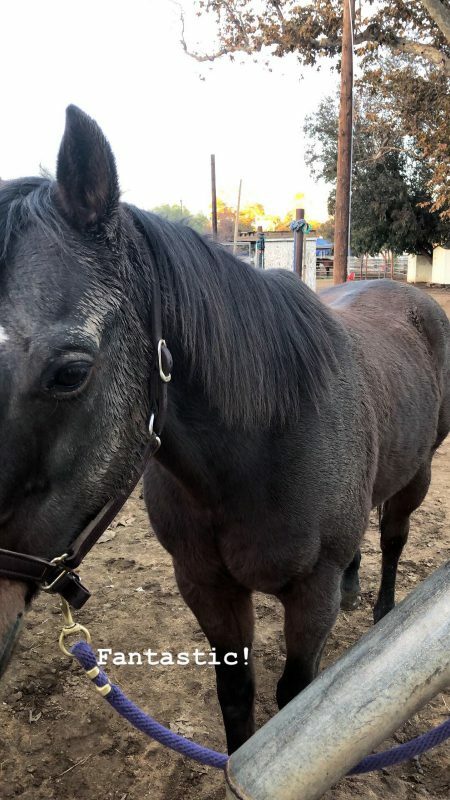 That’s an awesome little trick for soaking up puddles, too, so you can prevent your horse from standing in mud or water. My second major piece of advice is to get a turnout sheet or blanket, because it helps save time on cleaning a muddy horse! I’m located in Southern CA, so I don’t feel the need for a blanket, but a turnout sheet is helpful for keeping him clean. Personally, I have a Shires Turnout Sheet with no fill. It’s perfect for keeping him clean and he can wear it even if the sun decides to shine without getting over heated. Another turnout sheet or blanket I would recommend is our SmartPak Ultimate Turnout Sheet or Blanket. It’s backed by out 10-Year Indestructible Guarantee. Yes, you read that right- we will replace it for the next 10 years if it rips or tears! My last piece of advice for rainy weather is to make sure your supplements are set up. We all know that weather changes take a toll on our beloved creatures. Everything from gastric upset to digestive issues to hoof care and everything in between. Every horse is different so it’s helpful to know how weather changes effect your horse. For me, I keep my guy on SmartDigest Ultra for hindgut support, as well as SmartHoof Ultra Pellets. I know that his feet get wet and soft during the rain, so he needs all the support he can get down there. I also use Keratex Hoof Hardener for topical support and plenty of Thrush Buster! This is probably the only area that I was prepared for this year! I tend to have him on a regime very similar to this all year long, because even weather changes going from cold to hot has an affect on his body as well. I also work closely with my farrier to provide the best support inside and out for his hooves all year long. Getting ready for rainy season doesn’t have to be a slap in the face like it was for me this weekend – if you’re prepared and listen to the weather forecast, then conquering winter should be a breeze. Doing these few things will save a lot of time and energy in the future!